The oldest person in the world has died two days short of seeing her third century. Sarah Knauss, whose claim is recognised by the Guinness Book of Records, died on Thursday at the age of 119, just missing the new millennium. Mrs Knauss died of natural causes in a nursing home in Allentown, Pennsylvania. "She died quietly in her room. She was not ill," the head of the home said. "They had stopped in to see her just less than an hour before, and when the nurse went back, she had passed away." When the 20th century started, Mrs Knauss was already 20 years old. Born on 24 September 1880, in the coal town of Hollywood, Pennsylvania, she lived a quiet life running a home and working in the insurance business. She was older than the Brooklyn Bridge and the Statue of Liberty, and was almost a pensioner when the Second World War began. By the time of the Vietnam War, she was already in her eighties. Her relatives have attributed her longevity to the fact that she was a calm person who was not surprised by events. As one of very few people who have already seen one century roll over to the next, she would probably not have made a fuss about the arrival of the year 2000. 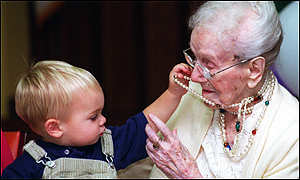 She became the world's oldest person in 1998 upon the death of Marie-Louise Febronie Meilleur of Quebec, who was 117. But when her family members walked her into the dining room to tell her of her new fame, she smiled and said: "So what?" She is survived by her daughter Kathryn, who is herself 96, as well as several grandchildren, great-grandchildren, great-great-grandchildren and great-great-great-grandchildren.